CFM Performance now makes it easy to vent the crankcase on your engine with our new billet valve cover breather kit. 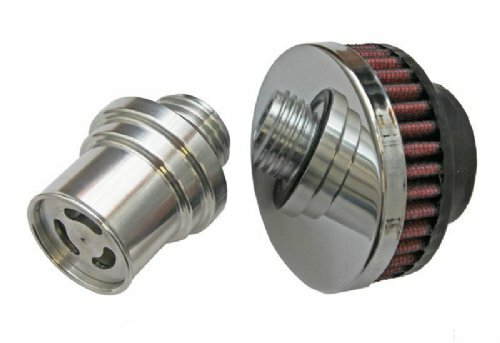 This kit is a direct replacement for factory screw-in oil fill cap and allows unwanted crankcase pressure to exit. The proprietary internal baffle substantially reduces oil particle travel without affecting air flow. A double-seal O-ring is used to reduce the amount of force needed to create a positive seal, increasing seal life and eliminating leaks. The filter element is washable and has a variety of top finishes for great looks. The pre-oiled cotton fiber traps dirt particles without restricting air flow. Although this kit was designed for use in racing applications, it works and looks great on any engine compartment.